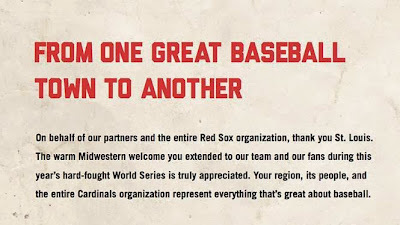 The full-page ad above appeared in the St. Louis Post-Dispatch (Thanks, Charles!) 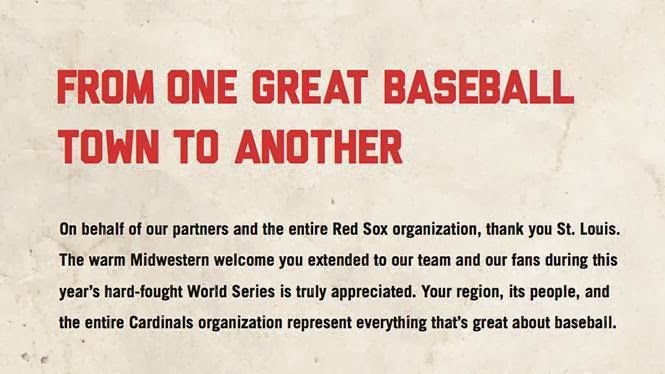 last weekend, after the Red Sox had beaten the Cardinals in Major League Baseball's 2013 World Series. I loved this ad for its obvious good sportsmanship, and also because it reminded me of two other life experiences. The second was in 2005. I was riding Rocinante west to California, to my brother Bob's house. (Shirl would later fly to Burbank, then we'd ride together on a two-week motorcycle tour of California and western Nevada.) As I headed across Missouri on I-70, I was following a maroon station wagon with a St. Louis Cardinals sticker on the rear window. Both the car and I pulled off at a service area, and parked. As I was following the woman and her two children into the restaurant, I called to her. "Excuse me, Ma'am, May I ask you a question about the Cardinals sticker on your car?" "Sure," she said, "what do you want to know?" "Well, I grew up in Chicago, and I was a Cubs fan, but I have always been curious," I asked, "how far across Missouri one must drive before he stops meeting Cardinals fans, and starts to meet Kansas City Royals fans?"